This entry was posted in Attitude and tagged positive attitude and cancer, terminal lung cancer. Bookmark the permalink. I think its such s strenght to keep that atiitude it well help you on your way! I wish you lots of happiness !! I really believe that a positive attitude is crucial in all things in life, but so much so in fighting this disease. Keep up the can-do attitude! You are so right, why not appreciate each day as it comes to us? So many people have so much but cannot see it. Not lung cancer Linnea… advanced prostate cancer for my dad. But I believe the attitude that you speak of in this posting applies to any and all cancer fights as well as many challenges we all face in life. I really believe at some point my mom said to herself, “I just can’t go right now. I’m not ready.”… and I think it helped both us and her. Now if I could only master those thoughts to that degree! 😉 It’s a work in progress. Yeah–when I speak of this disease, if I’ve not specified lung cancer I am generally referring to cancer in general. Certainly when you get to the advanced stages, they are each more similar than different. I’m with your Mom on attitude (but it took me a while to get there as well)–I just kind of decided I wasn’t going to die (yet). I figured that the least it would do is buy me more time, and that is really the goal anyway, right? 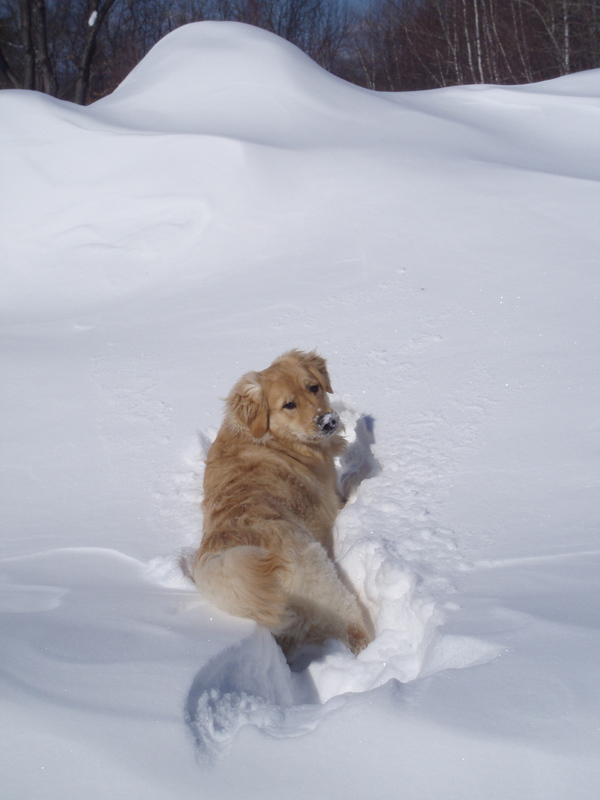 What a lovely dog and beautiful snow. I see why golden retrievers are the most popular breed. Retrievers are prone to hip problems and cancer like me. My old cockapoo use to curiously smell my mouth and look at me with a serious expression long before I was diagnosed with NSCLC. I bet he knew. How anybody can exchange an 8 moth old sick baby? they are part of our families and make us happier. Most of the snow is gone in Toronto , my 5 year old poodle returns from a walk covered in mud. Our lovely dog and beautiful green gardens. Taking Heparing for blood clots I am not allowed to take NSAIDS anti inflammatories but found out that I can using dog treatments!